Kids' WB! on Wednesday revealed details of the two-part season finale of X-Men: Evolution. The episodes, "Ascension -- Part 1" and Ascension -- Part 2" will air on Saturday, Oct. 18 and Saturday, Oct. 25, respectively. "The first of all mutant-kind, Apocalypse enters the final stages of his life-long mission - to wipe out all of humankind. Gaining full mind-control over the four most powerful mutants on Earth, he unveils his horsemen that he has selected to help him complete his destiny. As the line between good and evil is blurred, relationships will be tested and strained to the breaking point as friends, mothers and daughters, fathers and sons are pitted against each other - and every character from the past, good and bad, returns for this culminating face-off...that will decide the fate of all humans and mutants on the planet." There is no word yet if there will be a fifth season of the series. Image Comics is releasing a new original graphic novel, Shangri-La, in January. Written by Marc Bryant with artwork by Shepherd Hendrix, Shangri-La is the tale of a burned out gun-for-hire and a has-been rock star who form an uneasy alliance after the killer backs out on plans to assassinate the creaky old rocker. A hair-raising cross country chase ensues, with both parties doing their best not to kill each other before they can turn the tables on the record label that wants them both dead. "Shangri-La is what happened when I got too jaded about the music industry and started wondering if any of the rock icons ever faked their own death," Bryant said. "Things got out of hand soon after, and I had a full-blown chase thriller on my hands, one with quite a few laughs as well. 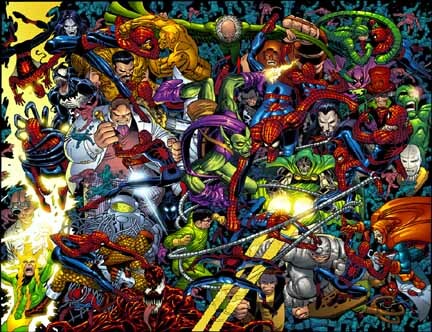 The bottom line is, it brings together two of my favorite things in life: comic books and rock and roll. There's a Dolly Parton cross-dresser, too. Not that that's one my favorite things. Please." With his story in place, Bryant's next step was finding an artist. "I auditioned a few different artists on Shangri-La, all talented folks, but I wound up working with a guy who nailed what I was looking for, right out of the gate," Bryant said. "I contacted Shep through Sharon Cho's agency, and within a few weeks he'd taken my script to another level, creating this smart, cinematic production that draws you in and doesn't let go until the very last panel." Hendrix, who lives in Northern California, has contributed to DC Comics' Big Books as well as Berni Wrightson's Captain Sternn, in addition to doing extensive work in the commercial art field. Knoxville, Tenn.-based Bryant is perhaps best known for his work on Cyberosia Publishing's Overtime, as well as various stories for anthologies benefiting the Comic Book Legal Defense Fund. Shangri-La is a 72-page one-shot priced at $7.95 and featuring a cover by Kieron Dwyer and Mal Jones. It will arrive in stores on Jan. 14. El Cazador #2 will arrive in stores on Wednesday from CrossGen Entertainment. The issue is written by Chuck Dixon, with art by Steve Epting and colors by Nick Bell. "Mutiny on El Cazador? Now that they�ve sobered up, will Captain Sin have to battle her own crew? If so, can she survive an onslaught by entire ship of pirates? Featuring bloodthirsty buccaneers, beautiful art and one brutal babe, if you�ve ever wanted to try a CrossGen comic, jump onboard this continuity-free thrill-ride." El Cazador #2 will be 32 pages and will cost $2.95. Ron Lea will be a guest-star in "The Breed," the episode of Mutant X scheduled to air in syndication the week of Oct. 13. Coming Wednesday: TV news -- and much more!! !